Hey, Floyd and Manny: Do Boxing a Favor and Fight Already! It’s a funny thing that occurred to me today as I was reading my friend Clay Moyle’s excellent book, Sam Langford, Boxing’s Greatest Uncrowned Champion: back in the very old days, boxers were willing to fight the very best available, all the time. To witness, Langford fought the Original Joe Walcott and Walcott’s brother, Belfield Walcott. He faced Sam McVea many times over. Langford beat Bill Lang, Andres Balsas, Jack Blackburn, Joe Jeanette, Jim Barry, the Dixie Kid, Al Kubiak, Philadelphia Jack O’ Brien, Bill Tate and Fireman Jim Flynn, the only man to beat Jack Dempsey by knockout. Langford also faced Jack Johnson and Harry Wills, losing against Johnson a very close decision, Johnson never wanting to meet his eager challenger again. Up until the “modern old days”, so to speak, we still had a period in which fighters were willing to engage each other. Money was an issue, as it has always been, but it seemed more then like pride was also involved. These were the days of Wilfred Benitez, Roberto Duran, Marvelous Marvin Hagler, Thomas Hearns and Sugar Ray Leonard in their round robin, of which Hagler-Benitez was the only fight not to take place (it almost did, had Mustapha Hamsho not beaten Benitez in June of 1983, it would have been Benitez-Hagler instead of Duran-Hagler in November that year). You had Alexis Arguello, whose resume had Ruben Olivares, Bobby Chacon and Aaron Pryor has Hall of Famers he faced, as well as should be Hall of Famers Alfredo Escalera and Jose Luis Ramirez, and Ernesto Marcel, Ray Mancini, Claude Noel, Jim Watt, Cornelius Boza Edwards, Billy Costello, Rafael Limon, etc. Two fights against other Hall of Famers, Salvador Sanchez and Edwin Rosario, only failed to materialize because Sanchez died and Rosario was injured in preparing to fight Alexis. Julio Cesar Chavez Senior, meanwhile, faced Rosario, Limon, Ramirez, Hector Camacho, Roger Mayweather twice, Juan Laporte, Rocky Lockridge, Lonnie Smith, Oscar De La Hoya twice, Pernell Whitaker, Miguel Angel Gonzalez, Kostya Tszyu, Joey Gamache, Giovanni Parisi, Frankie Randall three times, and, of course, Meldrick Taylor twice. Manny Pacquiao and Floyd Mayweather Jr. are not supposed to be. They ARE today’s best boxers. Miguel Cotto and Sergio Martinez are jousting for a distant third place in that category. Juan Manuel Marquez clearly deserves a fourth chance at Pacquiao, but he has not beaten him in three tries. Right now, talks are going on about a rematch between Pacquiao and my townsfolk Miguel Cotto, and about a fight between Floyd Mayweather Jr. and my co-Latin man, Saul Alvarez. But even the staunchest supporters have to see that Cotto and Alvarez have no chance, barring a huge upset of the Buster Douglas-Mike Tyson type, to win these fights. The fight we all want to see is Mayweather-Pacquiao! We have been holding, like a person who needs to pee but has no bathroom in sight, for this fight to take place since about early 2009. What will it take for it to happen? Are they waiting to see if the Mayans were right, so that after December 21st, they can both claim, in eternity and for eternity, that each one dodged the other one out? Or perhaps they are waiting for November 12th, on the 30th anniversary of that glorious boxing night in which Aaron Pryor beat Arguello in a fight with no glowingly descriptive words that make it justice? 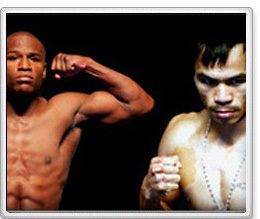 If, and when, Pacquiao and Mayweather decide to have a fight with each other, it will be great for boxing. Let’s not be ignorant and say that people in other areas do not fight for the right to be called the best. Don’t you think that Oscar De La Renta and Stella McCartney are like family to each other; they may like and respect each other, but deep inside, they hope that the one outshines the other at the runways. Likewise, when Enrique Iglesias releases a CD, he hopes to outsell Justin Timberlake AND Justin Bieber, AND Chayanne, and etc. Barack Obama and whoever the Republicans choose for a Presidential candidate will take their own fight to the urns in November. So will Governor Luis Fortuno, PPD party candidate Alejandro Garcia and Independence Party leader Ruben Berrios in Puerto Rico. Delta Airlines versus American Airlines, Pepsi versus Coca-Cola, the Smurfs versus Gargamel….in spite of all the bad things that some competitions bring about, and which I have spoken against, there are other things that competition brings, such as passionate fans who vie for one or the other, social argumentation, and the opportunity to unite-or to disunite- as a society to share what we have observed about our favorite this or that-or to fight over it and break each other’s heads with baseball bats and broken bottles hopefully we will choose the former and not the latter. Competition also brings forward attention to the issue at hand. If Pacquiao and Mayweather signed for a match, the match would be seen by boxing fans and general people alike, in the Philippines and the United States, but also in England, Puerto Rico and Mexico, where both boxers are very well known having beaten fighters from each of those countries, as well as in the United Arab Emirates, Germany, France, South Africa, Japan, Australia, Argentina, Russia, Ireland, Panama, Samoa, American Samoa, South Korea, Thailand, Italy, Fiji, Guam and most other boxing-happy countries where people could identify with either one or the other. Don’t be mistaken, this fight could represent the beginning of a worldwide revolution in boxing that could potentially make the sport we love finally become the “fifth major league” sport in the United States. And that is the country where boxing needs help the most. In most countries, and you shall believe this or not depending on where you live at, boxing is a seriously major sport, mostly lagging only behind association football. Talking of which, look at how close association football has come to be considered that fifth major in the United States, with the Major League Soccer in it’s 15th year and teams averaging about 30,000 fans per game. This all came after the 1994 World Cup, played in the USA. Mostly nobody expected that event to affect Association Football so positively and for so long in the States. But it did. That’s how much an event of that magnitude can do for a sport. So, in conclusion, guys…guys…guys, Manny and Floyd, what will it be??? Will you be like Jack Johnson and run away from each other for the rest of your life? Or will you be like the 1994 World Cup and give us a fight we all want to see and boxing a lifting experience the one like we may have never seen before? The…ehem….gloves, are on your side of the court!.